Hey sweet friends- Happy Friday!! I’m so bummed that this post is coming at you so late in the day, but we had a CRAZY thunderstorm last night and it knocked out my internet so I had to wait for the cable company to come out and fix it after work today. The perfect way to kick off the weekend right?! ha. Time to bring on the wine and ALL the sales!! 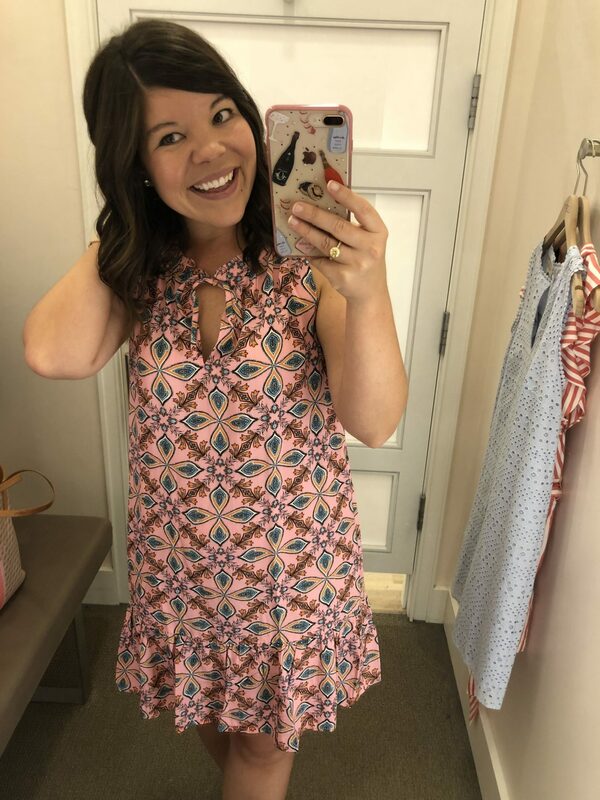 I’ve been working really hard to stick to what I learned during my month of not shopping – but that doesn’t mean this girl can’t look and pick out a goodie or two from the weekend! And I feel like everyone is bringing out the “big guns” this weekends and the sales are insane! I’ve got so much to share with you so let’s just hop on in and get to all the goodies! 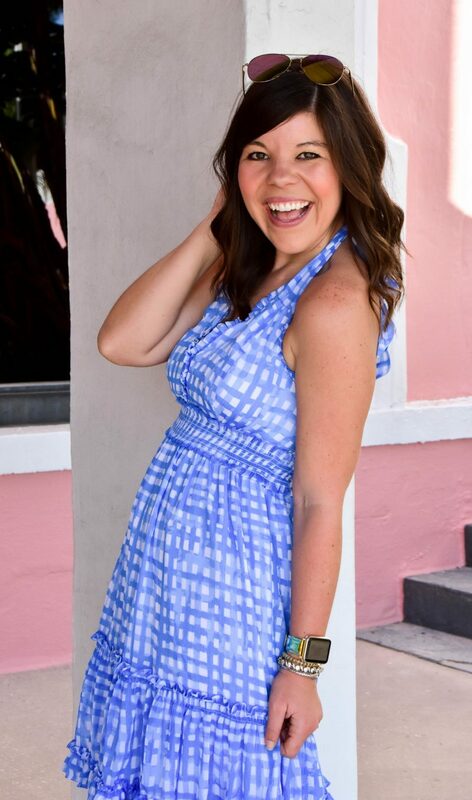 First up, we’ve got so much newness and fun from my go-to retailer: LOFT! Right now they are offering 40% off everything with code “LONGWKND” which means everything you see below is on major sale! 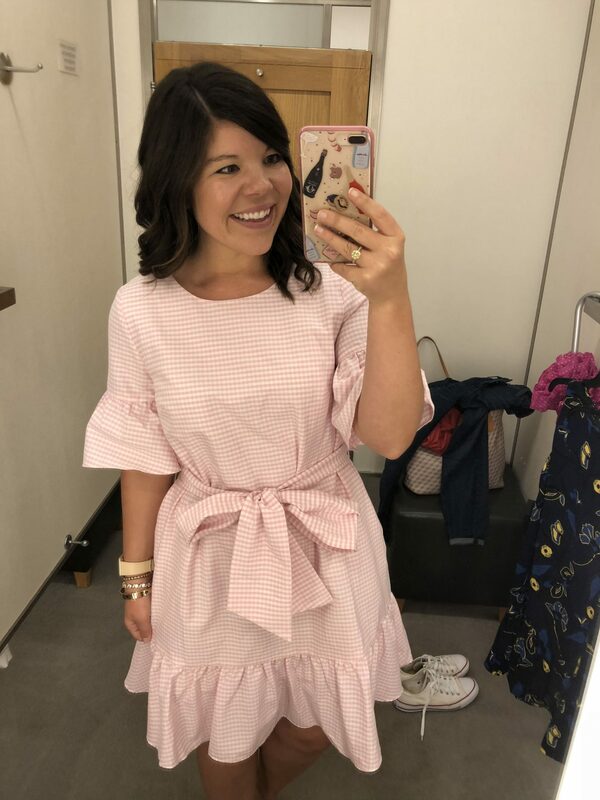 Medallion Ruffle Tie-Neck Dress – I’m so into all things pink & ruffled so this dress is two of my current favorites! Wearing a size Small and fits TTS. 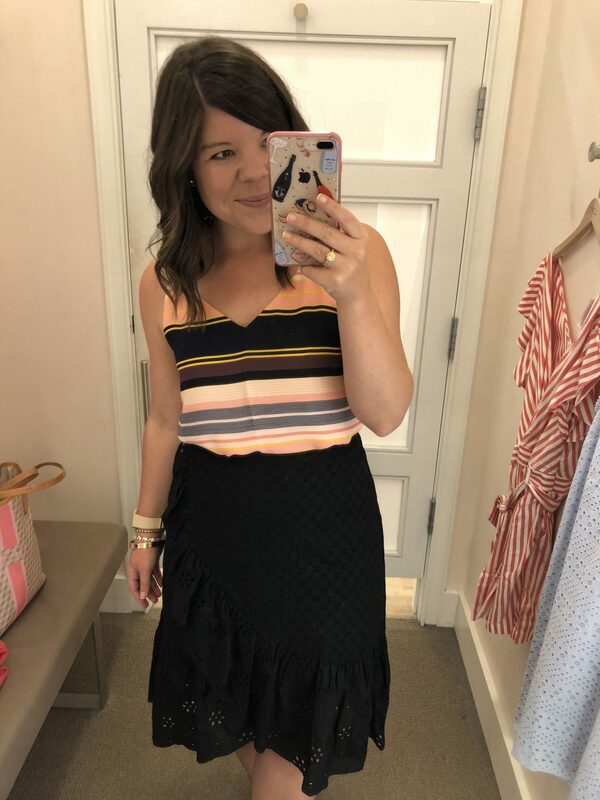 Striped Cami & Black Ruffle Wrap Skirt – I had this tank in my dressing room and randomly paired with this skirt and I think it ended up pretty cute! I tried a petite size in the skirt so that it wouldn’t be too long on my short legs and I loved it! It’s such a cute one to add into your workweek rotation. 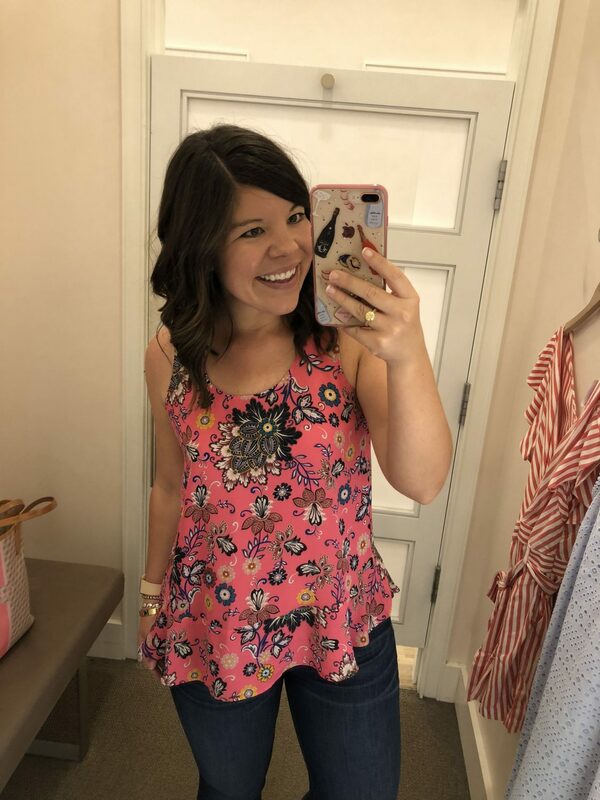 Pink Ruffle Shell Tank – See what I said about pinks and ruffles?! This would be darling with jeans or even with black pants for work. I love what a bright splash it would be! 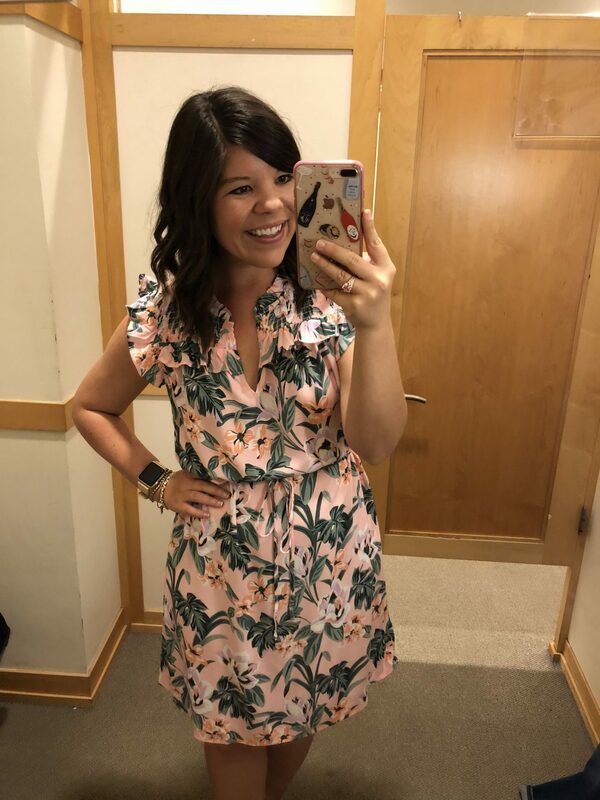 Pink Tie-Waist Dress – If you loved the print above but wanted it in a different piece, I also loved it in this dress! The colors are so vibrant and fun, and there is even a sassy cross-over detail in the back. Love it! Beaded White Tee – This is the most perfect update to a plain white tee- the beaded detail is gorgeous! It’s such a high-quality detail that really adds so much “umph” to a look! 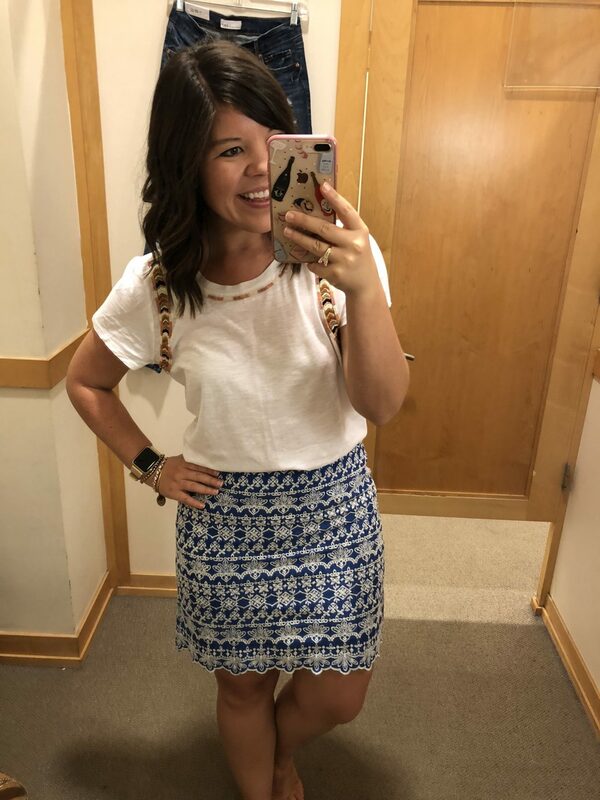 Blue Lace Skirt – Ok this definitely doesn’t go together, but it’s all I had in the dressing room! ha. This skirt is so pretty and just screams “coastal summer” to me! Unfortunately my hips are a little to curvy for this look, but if you have less junk in your trunk this is a winner for sure. 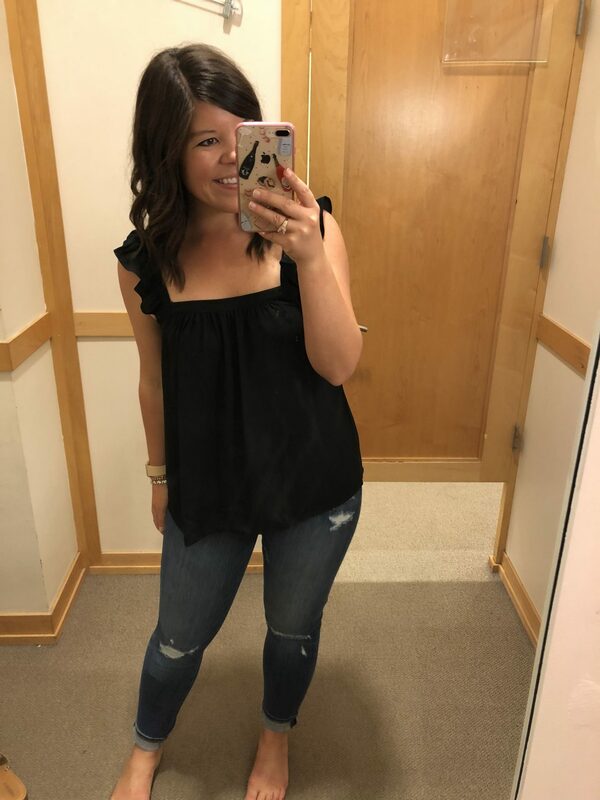 Ruffle Black Cami & Distressed Denim – This look is a little “edgier” for me (or as edgy as the Loft can be! ha) but I loved the sweet black tank and sassy distressed jeans. 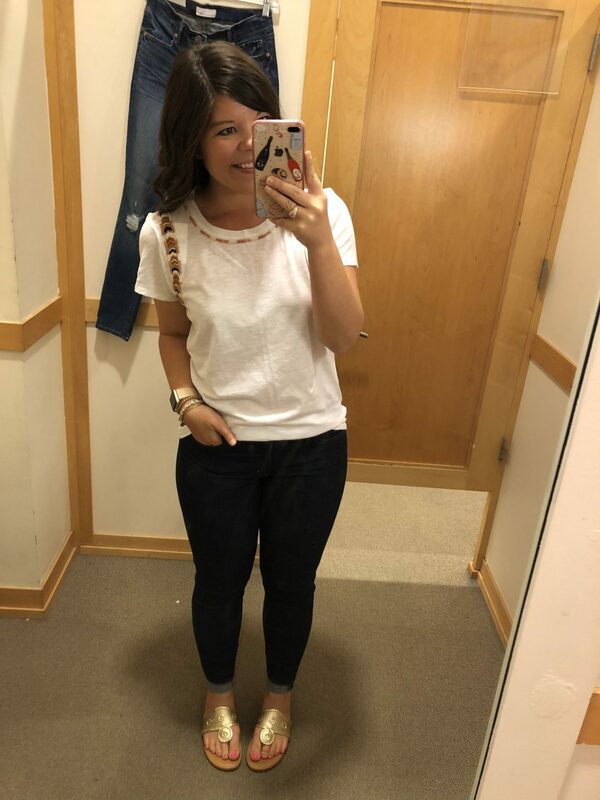 These jeans had so much stretch in them too which made them the perfect fit! 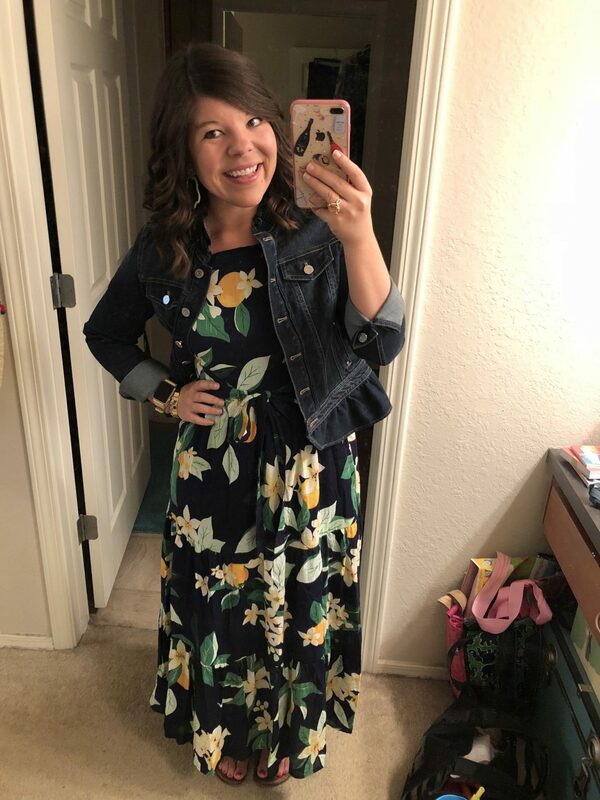 I see this outfit with wedges for a Girl’s Night Out- now to plan one! Watercolor Pink Striped Dress – This is such a happy dress! I will warn y’all that it does run big, like really big! So definitely size down at least 1, if not 2, sizes. But how sweet would this be for a beach vacation? 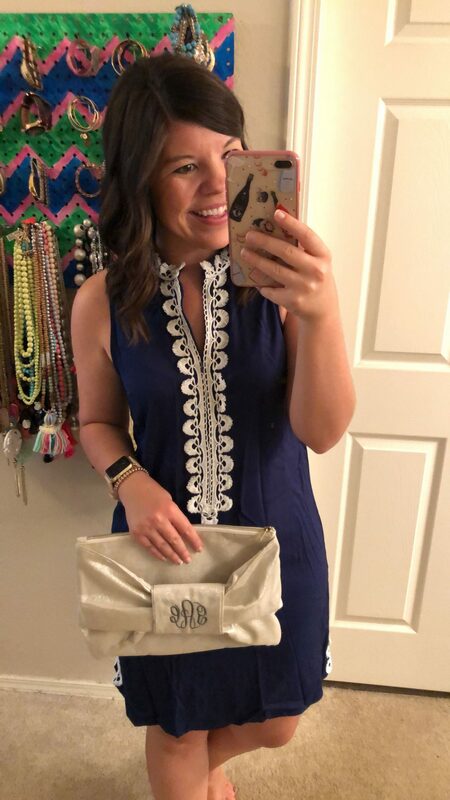 Lilly Ruffle Tie Waist Dress – Everyone has been raving about this dress, and now that I’ve tried it on I can see why! The colors are so pretty, the pattern is feminine and fun, and the shape is perfection! I scooped up this one to take to Vegas with me next week for work! 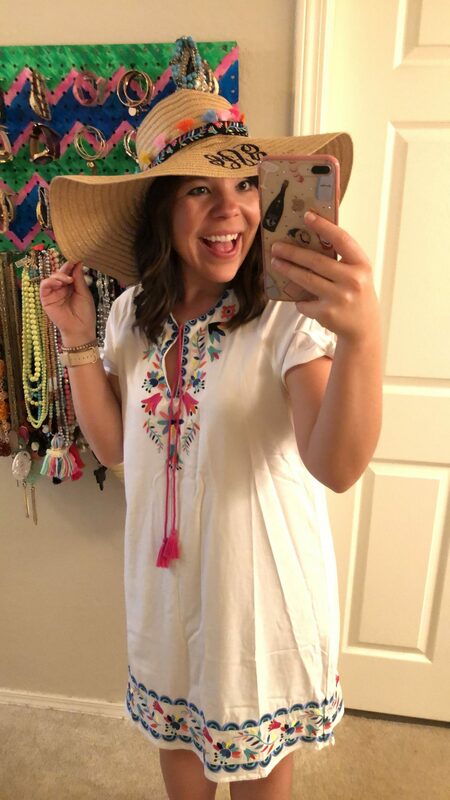 Duet Swing Dress – Hello perfect Memorial Day dress!! 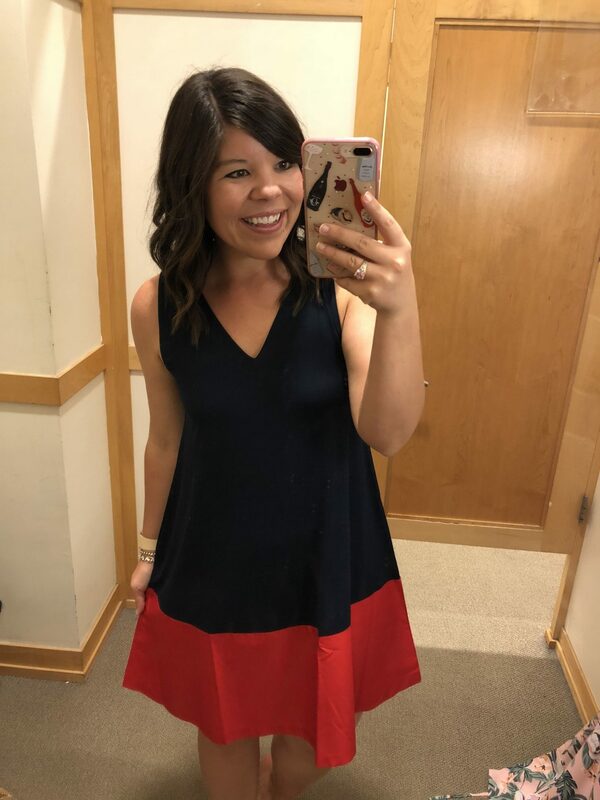 This red & blue cutie is so sweet, has such a flattering shape, and is so patriotic! This also would be a perfect dress for the 4th of July 🙂 It does run big so size down one from your normal size. 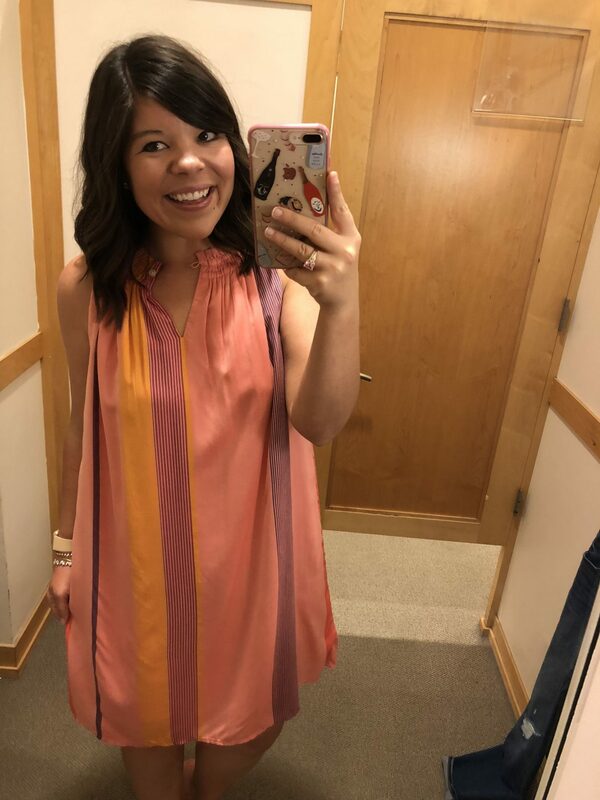 Coral Springs Tie Neck Dress – This is the most unexpected find from my try on sessions! I really wasn’t sure about the color (olive isn’t the most flattering on me) but somehow these colors just work so perfectly together! I brought it home with me and have gotten so many compliments since- so I think this one is definitely a winner! 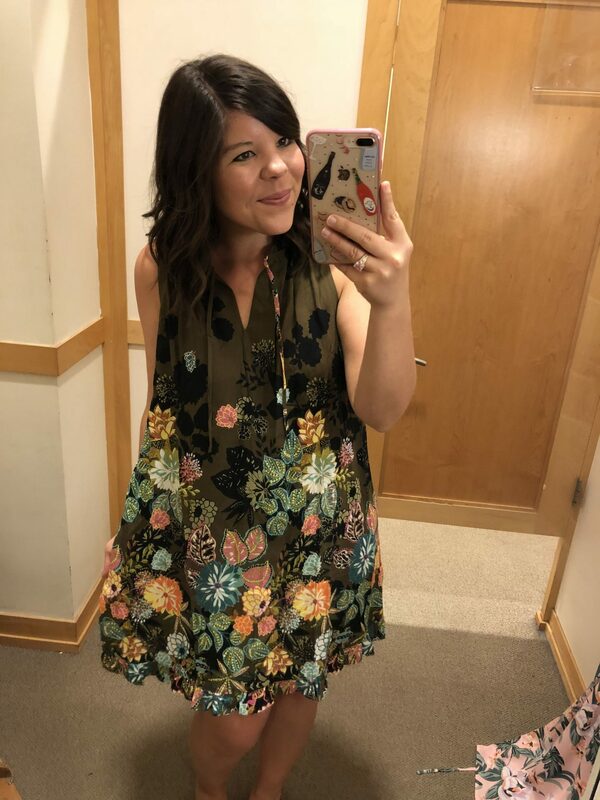 I won’t reiterate all the fabulous finds from the Nordstrom Half-Yearly Sale (and really there are SO many!) but you can check out my full post here. These are just a few recent finds that I love so much! 1901 Ruffle & Bow Dress – Sweet as can be! That’s how I describe this little cutie pie dress 🙂 The gingham is just precious- and oh that big bow!! I love love love! 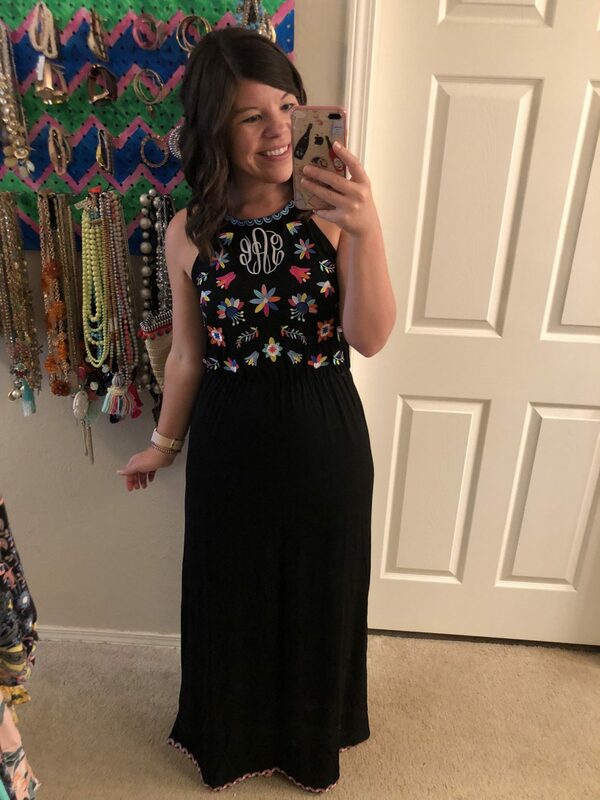 I couldn’t love this maxi more!! The colors are super vibrant in person and the detailing is perfection! I’m super impressed by the high-quality knit and construction too! PSA: The sweetest maxi dress of all time is back in stock!!! Run, don’t walk, to scoop up this vintage Florida perfection! Hope y’all have a great long weekend! It’s supposed to rain here every day (boo!) but I’m still looking forward to some serious relaxation! I love the “dressing room” diaries part! Such a fun idea! These are really cute items dear, especially that blue lace skirt! Love the pattern. Looks so pretty with the white tee. Oh wow.. those are some really cute dress and tops.. like really cute! Great outfits! My favourites are the Lily Ruffle tie – no wonder everyone has been raving about it! Looking forward to reading about your Las Vegas trip – last time I was there I was 14 – eeeek! 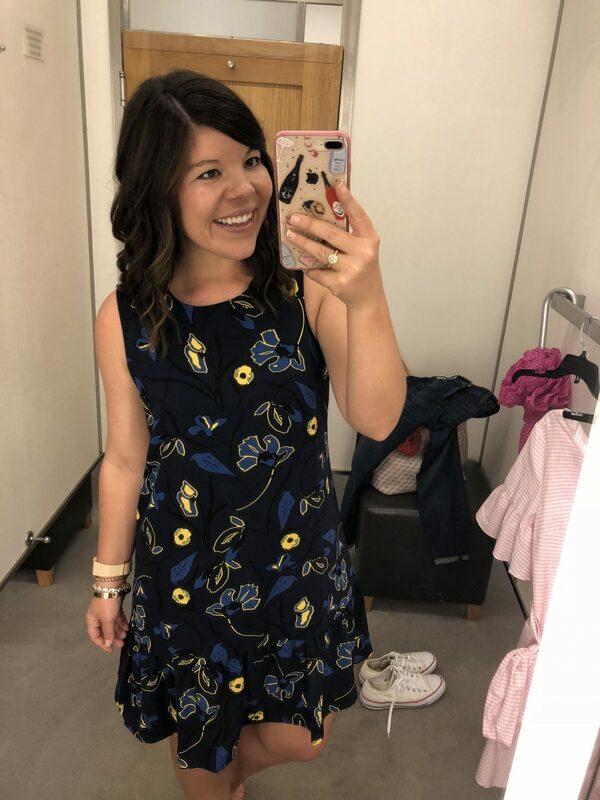 You have the cutest dressing room diaries! 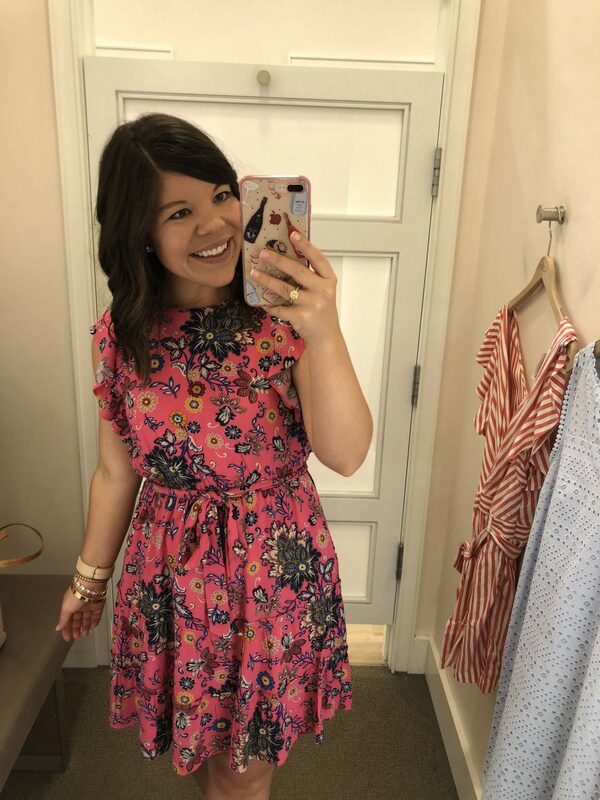 LOFT has so much good stuff right now — I love that blue swing skirt and the pink palm dress is one of my favorites as of late! Your sizing info is sooo helpful — thanks for sharing :] I know it’s not always easy to share that stuff.